Innovative cleaning fluid for Air Condition unit coils and filters. It cleans quickly and easily, while it offers protection from microorganisms. Free of allergens, ammonia, phosphates and petroleum derivatives. Human and environment friendly, per the european directive EC 648/2004. This specific directive governs the composition of detergents with respect to their biodegradability. Essential for the cleaning care, the protection and the hygiene of all premises burdened daily from the recycling air moving through A/C filters during its operation. Removes from Air Condition filters accumulated dust and cigarette smoke as well as pollen and air pollutants. It removes unpleasant odors, leaving a pleasant, fresh scent. 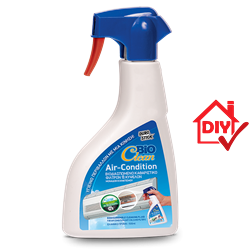 Once dry, it yields perfectly healthy and clean air moving through the A/C unit.